Today, when you order "Aldo Colombini's Impromptu Card Magic Volume One", you'll instantly be emailed a Penguin Magic gift certificate. You can spend it on anything you like at Penguin, just like cash. Just complete your order as normal, and within seconds you'll get an email with your gift certificate. 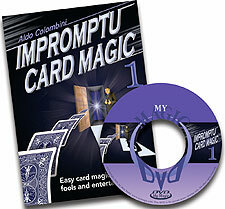 Aldo Colombini's Impromptu Card Magic Volume One (DVD) All you need is any deck of cards and you're ready to perform high-impact routines. Quick & Direct (Harry Lorayne): A selected card is found by the process of elimination. Trost And Us (Mike Rogers): A demonstration of a human scale has you cut the exact amount of cards that a spectator has randomly cut. Family Reunion (Aldo Colombini): The Jacks, Queens and Kings are shuffled and cut. A spectator selects one of the cards and its mate is found by a process of elimination. As a surprise ending all of the cards have now found their mates. The Nervous Ace (Tom Daugherty): A freely selected card is named as the spectator miscalls it while going through the deck. The Great Thirstin (Marty Kane): A card found from a spectator's packet matches your prediction. A Lucky Card (Richard Vollmer): The four Aces are lost in the deck by a spectator and are found by spelling to them, with the last Ace being found using your Lucky Card. More Lies (Robert E. Neale): A spectator thinks of a King or a Queen. Their card is found using a lie detector theme that always corrects their lies and finds their selection. Duck And Deal (Aldo Colombini): The total of a spectator's two selections is used to determine the size of a packet that finds a previously selected card. Twinkey (J.K. Hartman): You find two selected cards under seemingly impossible conditions. Count On Them (Aldo Colombini): Four cards disappear, one at a time, from a packet of five. The remaining card is the selection. Dancing (Aldo Colombini): A selected card is found by spelling the name of the spectator who chose it. Vintage (Aldo Colombini): Three cards are used as indicators to find the selection. One of the indicators, which surprisingly was the selection, vanishes and appears face up in the middle of the deck. 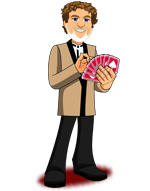 Aria (Aldo Colombini): Four Aces are each covered by three cards. The packets and Aces are now lost in the deck. The fourth packet with the previously named Ace is magically shown to contain all four aces. Backfire (Aldo Colombini): The four Kings are lost in the deck. The deck is shuffled face up and face down. A spectator takes an indifferent card and uses it as a magic wand by waving it over the deck. Magically the entire deck is now facing the same way except for three Kings. The indifferent card, which has remained in the spectator's hand, magically turns into the fourth King. Sarabanda (Aldo Colombini): A spectator cuts the two Jacks, face-up, into the deck. When the deck is spread the two Jacks are found next to the two previously selected cards. Produced by Meir Yedid Magic. Original release date: August 2005. Running time: Approximately 85 minutes. In this dvds you find impromptu tricks, you will find a very special selection of tricks that are very simple to do and very amazing, that you do with a normal deck of cards. Aldo Colombini has selected very good tricks that don't require major sleights. It's all in your presentation. I like his simple and easy to follow demonstrations and his pace. He doesn't use flashy desplays which I think improves the effects. The spectator can't see when the moves occur. I like the use of a few very easy but effective techniques. Not too many of these tricks are very high impact, but some are great, yet easy. Vintage great and easy, Dancing is another great one, and I think the best one is Aria. There are some more that I didn't name but, overall, I liked it a lot. Impromptu,easy to do, and effective. I find this collection to be effects that are nearly self-working, moreso than some discs that claim to be "self-working." It's easy, and I like it better than some of Aldo's packet tricks, which require lots of unnatural moves, counts, flips, doubles, tons of routine memorization, etc. This stuff is easy and I can't imagine someone who wouldn't be able to implement several of these into their working routine. While the work is easy, it's not "common." There's principles here that fills some holes in my magic education. Principles I never thought of. Awesome.